Putting the clocks back at the end of October is something I always look forward to. It means that I don’t have to get up when it’s dark for another few weeks. Moreover, on a Sunday morning I can lie in till 8.45. That (should have) meant 9.45 today – bliss! Back in England I used to keep one clock at GMT – just for the hell of it – and visitors were often confused after wining and dining and having a coffee and digestive in the lounge sitting opposite my rogue timepiece. In France, of course, GMT doesn’t exist. We are always an hour ahead, but at least the hour changes on the same days now. Years ago there were usually a few days of total confusion when ‘energy saving time’ and BST couldn’t get it together. So this morning, there I was, snuggled in bed, relishing the thought of an extra hour. But the cats decided otherwise. About six o’clock I had to make a little trip to the loo and after slipping on catsick yesterday morning trying to make my way in the dark, I swirched on the light in the hall this morning. Big mistake: Holly decided it was time to get up and followed me back to the bedroom to be let out of the window. The other felines appeared to be comfortably settled so I curled up in bed myself. After a few minutes Toby started to pat me on the cheek, gently at first, but then his claws came out. Turning over just meant he came to attack the other side so I got out of bed and let him out as well. This was a cue for the others to wake up and start playing, chasing each other over and under the bed and pouncing on any hand or foot that happened to move. It was nearly 8 o’clock. I got up. Almost American posted this on her blog. All the blogs I read from the States and Canada are solidly anti McCain/Palin and I’ve seen many articles and news stories which make me feel very afraid of the possibility that the Republicans could get another term. The “World” seems overwhelmingly in favour of Barack Obama. All through the Summer our garden was a complete disaster and the front of the house was a disgrace. We had planted some beans and peas but they were completely overrun with weeds. 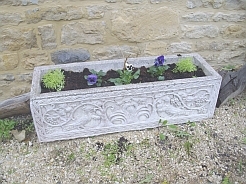 The strawberries were pretty awful due to too much rain, the slugs ate the cabbages, carrot tops and lettuces and the beetroot and parsnips tasted rather odd – perhaps because my ‘raised beds’ were made from treated wood. During the few days of relatively warm and rainfree weather last week CC and I made an effort to tidy up a bit. The front of the house is not really a garden but most people try to cheer up their facades all year round so I don’t want to let the side down. 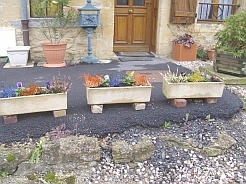 We cleared the weeds as best we could (weedkiller is not a good idea because of the well) and then we planted coloured heather and pansies in pots. The plants either side are heucheras. I don’t know what the little green plants are called. CC is horrified at the brightly coloured (dyed) heather but I think it cheers the place up. In the back garden we worked on the bed that was such a disappointment last year. 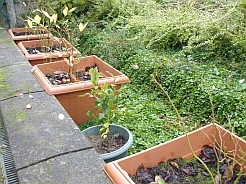 We put in lots of plants in the Autumn but hardly anything grew except weeds. I dug it over again and sowed a herb garden, but once again, the weeds took over leaving just one plant worth saving. The problem is, I have no idea what it is. 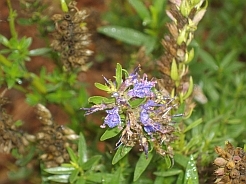 The seeds smell a bit like lavender and the leaves have a scent similar to tarragon. Can anyone identify it please? In an attempt to prevent the weeds spoiling everything again we have buried a few pots to plant herbs in and covered the soil with little rocks. 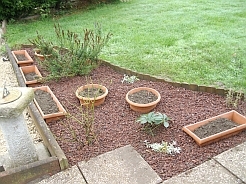 One hellebore and a rose bush remain and I’ve put in two rosemary ‘bushes’. For some reason rosemary doesn’t do well here. I’ve just had to dig up the remains of my third bush because it died, so there’s one at each end of this herb garden in the hope that at least one will survive. There were similar problems with blueberry bushes. I made two attempts at planting them near the fence but they disappeared – perhaps because people mowed over them when cutting the grass. Two years ago I planted a couple in pots and they did well so last year I added two more. 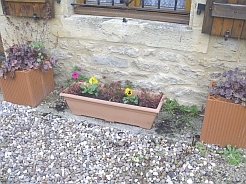 This week I bought four more and put them in smaller pots in between the established ones. Now it’s fingers crossed I may have enough ‘myrtilles’ to make a crumble – or even some jam! Early in November a former colleague of mine (a retired sports teacher) is coming over for a week to do some gardening in return for a holiday. His wife wants to practise her French so everyone should benefit. I’ll post some photos when it’s finished but I don’t think it will ever compete with Johng’s or Pat’s beautifully kept gardens. After narrowly escaping going up in flames thanks to the previous owners bad wiring we have learned of yet another example of his workmanship this evening. It concerns the fireplace which has never been efficient although it looks quite attractive. Friends of ours showed us a wood stove that they were having installed because they were convinced it would be much more economical and straightforward to run. Bear immediately decided that we should enquire about the possibility of having one in our living room so yesterday we went to ask at a local shop. The helpful lady took down the details, gave us a brochure and said the boss would be in touch to come and have a look. At 10 to 6 this evening he phoned to ask if it would be OK to arrive in five minutes! He looked at the fireplace, tut tutted a few times and then smiled. 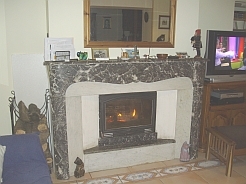 “I’ve been here before, to deliver this fireplace but it’s been installed wrongly. It wasn’t me who put it in.” he hastily added. It seems we are not getting much heat because it’s all going up the chimney instead of into the room. We had noticed that you can stand right in front of the fre and not feel hot and the various vents in the walls don’t produce any warm air at all. However, the (probably) good news is that it should cost less than a new wood stove to put it right while the (definitely) bad news is that it means making a hole in the wall and a big mess. He’s promised to give us an estimate but he didn’t say how long that might take. 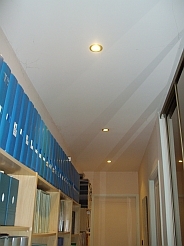 The spotlights upstairs which could have caused a major fire. No wonder the notaire stressed “You realise you are buying the house ‘as seen’ “, when we signed the papers. It is some time since the spotlights started to go out in Jay’s room and then in CC’s bedroom too. When it got to the stage of one light left (yes we did try changing the bulbs but that wasn’t the solution) it was time to call in an electrician. The yellow pages listed several nearby, in fact there is one at the end of our road but since he backed into Jay’s car a few months back I thought I’d avoid him. I called a chap who lives a few miles away. He answered personally and said he’d come to do an estimate that afternoon. I was pleased but then I wondered why he had so much free time. Anyway, he seemed to know what he was doing when he came to inspect the job. 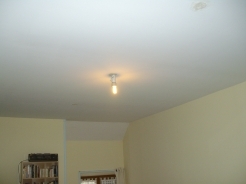 The problem was the spotlights which the previous owner dotted all over the house. It seems they get very hot but the ones in the bedrooms had been covered with fibreglass insulation AND also had wires over the top of them. He claimed we had come very close to having a fire and he may well be right judging by the melted piece of aerial wire he showed me. It was agreed that we would replace the spots in the bedrooms with ‘ordinary’ lights but the ones in the toilet and hall would remain and be protected by earthenware flowerpots! “I’ll bring you the estimate tomorrow.” he promised. Four days later he turned up with an envelope and came in for a coffee to explain it. He would put two lights in Jay’s and CC’s rooms (plus another in her bathroom) and just one in the guestroom. 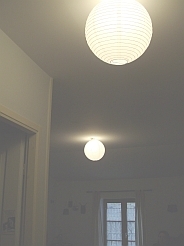 He suggested longlife low energy bulbs and I opted for bright ones – only 25w but they give the same light as 100w normal bulbs. CC and Jay later found the low energy bulbs hurt their eyes because they gave out too much light and promptly replaced them with ordinary bulbs. He agreed to come and do the job ‘on Thursday or Friday’ but I asked him to ring and let me know. He rang on Friday evening to say he’d be round at nine o’clock on Saturday. He actually turned up just after eleven with his son in tow. They worked hard and I get the impression it took longer than they had envisaged, climbing about on top of the bedroom ceilings among the itchy fibreglass. When it came to turning off the power they asked where the control panel was. I showed them and asked if they had brought a torch. They were hard at work after midday so I went to see what was happening. They were not finished as they still had to fill in all the holes in the ceiling where they had removed the spots. Thye came downstairs for a beer and said they’d be back ‘tomorrow’ – i.e. Sunday! This time CC and Jay didn’t believe they would be here at nine and stayed in bed. Of course, they came just after 9.30! Lunch was cooked and stashed in the hostess trolley but it was getting on for half past one before they came down for an apero. They still hadn’t finished. One of the lampholders was faulty so they’d have to replace it and the plaster would need sanding when it was dry. After a couple of pastis they left, promising to be back on Monday “or if not, definitely on Thursday” were his parting words. They did not make an appearance on Monday so it’s fingers crossed they turn up tomorrow – but I’m not counting on it. The fence is finally finished! After nearly two weeks of non-stop rain, yesterday we spent the afternoon n the garden putting the finishing touches to the fence. Here’s my idea for the corners: a triangle of netting placed over the top and tied in place. 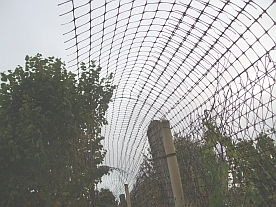 Otherwise the top of the fence curves over about a foot – hopefully enough to prevent escape. Unfortunately the men ordered wooden poles so, although they’ll make good scratching posts, there’s a danger the cats will try to climb them. 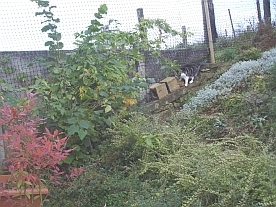 The awkward bank where Parsley loved to get through to the neighbours has been pretty well catproofed – much to her disgust. She has tried to climb up it without success (so far!) but she got her own back by managing to jump onto the conservatory roof. We’re not sure how she did it but we have put more netting up over the shed. CC and I deserve a bravery award for doing this because there was a HUGE wasp spider watching us from the shed door. 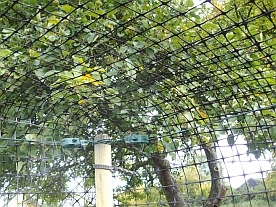 The other danger area is the hazlenut tree which is quite close to the fence. We’ve put a wider piece of fencing in place here. 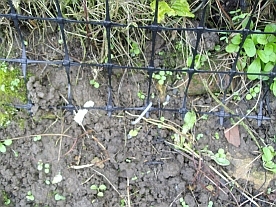 Thanks to advice from Zuleme of Caturday I went round putting in large staples to fix the fence to the ground. This was easier said than done because there were lots of rocks in places and in other parts they went in far too easily which means that the cats could probably pull them out. So regular intervals had to be abandoned in favour of safe holding places. 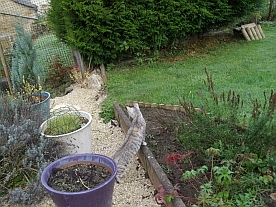 So, what did the cats think of their rediscovered freedom? 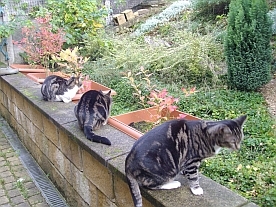 Well, they all had a good sniff round the perimeter and then Parsley and the twins sat on the wall to think about it. Meanwhile Willow had her first ever play in the garden. 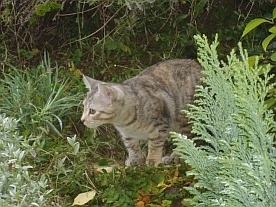 At first she went up and down the steps , sometimes putting her nose inside the door to make sure her route home was still there, but soon she was racing round the bank like a mad thing, leaping over the other cats and thoroughly enjoying herself. She sniffed all the plants and tasted the grass, climbed over the flower pots and had a really good time exploring. It looks as though Willow is going to make the most of her new playground. Bretonne sent me an email with a link to this map from a blog called Strangemaps. it gives an insight into the French custom of kissing but the main problem is that the rules are variable and, in my experience, even French people are inconsistent. Take our region, for example. According to the map we are a four-kiss area and many of my friends would agree with that. However, you can never be sure that the person you greet is going for the full number. Many is the time I’ve expected four and only had two – and vice versa! The older men tend to go for four -and they can be sloppy -whereas the ladies are more inclined to stop at two, barely brushing your cheek. Children tend to kiss everyone at first meeting – but just once. Even the boys are expected to kiss men when they are introduced. Of course, most men will kiss other men in their family and good friends will do likewise. I remember how Bear was taken aback at first when given a hug and kiss by a Frenchman! After six years I’m kind of used to the custom and inadvertently confound English visitors by going for at least two kisses when they arrive. However, in our household we don’t kiss one another several times every morning so we’re not fully integrated yet!